PosterBox...online solution for fast, high quality digitally printed posters ~ for over a decade! PosterBox provides a positive online environment for our customers to order poster printing fast, easily and securely. We provide visitors to our site the information they want, such as prices, quickly and easily. One of the many frustations of ' web surfers' is that websites tend to hide the information you want deep within their site. For example you may be searching for a price for a particular widget, you don't want all the fluff and distractions many websites throw at you, you want to know the price! With PosterBox you can view prices and start your order from almost every page on our website! We are sure once you have seen our discount pricing you will want to order! We appreciate that price, while important, is not the only reason to trust PosterBox with your printing. 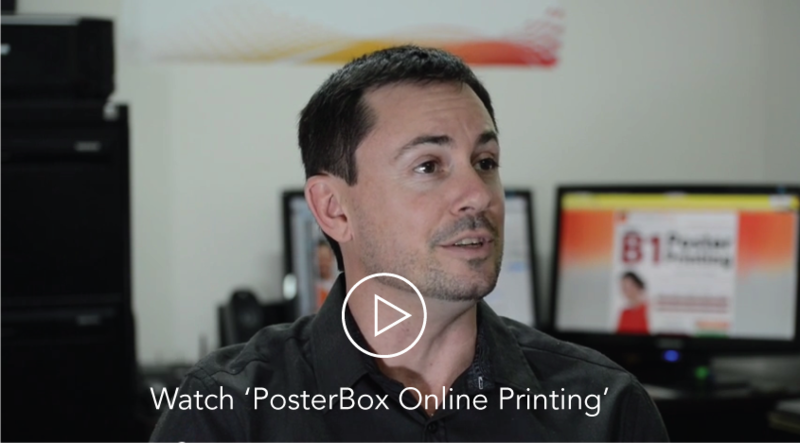 PosterBox uses the latest in digital poster printing technology to print high quality full colour posters. Posters can be printed at various sizes including A0, A1, A2, B1, B2 and 750 x 1000, or custom size on a variety of media. Standard orders are despatched same day and freight is trackable online. Working within the industry Richard Stoute and Neil Moretto have 45 years combined poster printing experience. We came to understand that printing businesses needed to stop using their website just as a billboard. Our website is designed so our customers can achieve want they want quickly and easily - PosterBox is a full online poster printing service. Placing an order or viewing a poster printing price can be achieved within seconds at PosterBox, we make it easy for you to find the information you need most. An online business needs to change and be innovative to stay ahead of the competition. By incorporating the latest digital large format printing technology and exceeding the expectations of our customers in terms of service, high quality and reliable delivery, PosterBox is going from strength to strength. Same day despatch of your poster prints is something we feel very strongly about and respect the trust a client is placing with us when they order. We appreciate the time constraints we all experience with day to day business - worrying about your poster printing with PosterBox is a thing of the past. Our choice of freight service is TNT. It is through extensive research and, at times some painful experiences, that we chose, TNT. TNT has become a successful partner and continues to provide a fast, consistent, trackable and reliable freight service. We are unwavering in our continued drive to improve PosterBox through research and development and most importantly feedback from our customers. We are forever striving to deliver the ultimate in customer service and we hope that your dealings with PosterBox are just as rewarding.